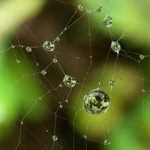 Sometimes without explicitly using the word “innovation”, it is clear that the solution for many water related problems lies within social, institutional, technical, and business innovations. When feasible (and often innovative) solutions are found and suggested, barriers for implementation remain and can often not be addressed by a single person or organization. To overcome these barriers a variety of partners, coordinated through the International Project Office of GWSP, recently initiated the Water Solutions Lab Network (WSLN). The WSLN will establish a series of lab-workshop in different regions of the world, each of them focusing on a particularly relevant water related issue. During the labs, representatives from many different parts of society (public and private sector, scientific community, civil society, NGOs and others) will come together and based on previously gathered information work towards and innovative solution for one of the most pressing water related issues in the region. The implementation of innovative solutions will be monitored and supported by the WSLN and the learning experience from one lab-process will be used to increase the impact of subsequent labs on different topics or in different regions. lack of understanding of the implementation and adoption process. Within the WSLN framework, representatives from different parts of society (public and private sector, scientific community, civil society, NGOs, and other) will come together and work towards developing water related innovations. Thus, the developed product will be based on a broad range of subjective preferences and concerns from different sectors and people from global, regional and local level. It will open up opportunities for a wide range of technical, business, institutional and social innovations. The WSLN will organise sets of different ‘Innovation Labs’ each with a focus on a particular region. The labs will comprise three phases: the pre-lab phase, the lab phase, and the post-lab phase. The pre-lab phase is designed to establish a knowledge base on water related challenges and issues of a particular region form local and global perspectives. The lab phase brings together representatives from different stakeholder groups (science, industry, NGOs, government, civil society) to work on particular water related issue in the region and develop solutions. The post-lab phase is dedicated to the implementation of the innovative solutions. This also includes a scientific component to monitor the implementation process itself and the longer term impact of the innovation. Labs can therefore benefit from the experiences made in previous labs. The first Innovation Lab of the WSLN is planned to take place in India. India’s water resources are under growing pressure due to population growth and rising incomes. It is widely recognized that past approaches of supporting development do not suffice in the face of present and future challenges. Solutions to water related problems, such as too much or too little water at a given time and in a given place, challenge the well-being of many people in the country. Efforts to solve these problems are ongoing and it is widely accepted that interdisciplinary approaches and solutions are needed when confronting these challenges. The Water Innovation Lab India as part of the WSLN will herein serve as a platform bringing together actors from different sectors to develop solutions and deliver them to stakeholders for implementation. 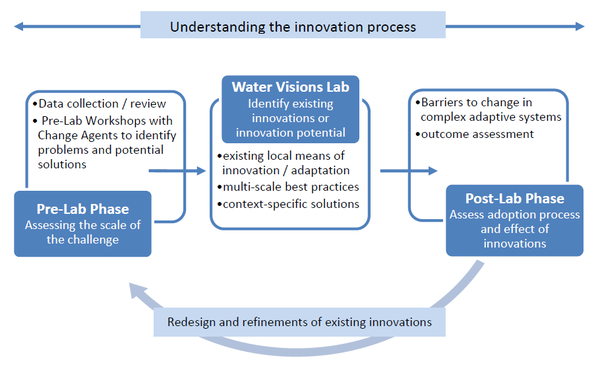 According to the process design illustrated in the Figure the Water Innovation Lab India will integrate and build on existing innovations to create and identify gaps in knowledge and implementation of water related solutions. Participants of the lab will come from a variety of professional backgrounds and sectors and the setting will enable an integrative, nexus oriented perspective on water related problems and solutions. During the recent international conference in Bonn on “Sustainability in the Water Energy Food Nexus” in Bonn, Germany, a special session (A05) was organised to introduce the concept of the “Water Solutions Lab Network” to a wide audience and share insights into the development of the project while opening up space for discussion, comments and feedback. Following up with the inputs from the participants of the conference discussions with a variety of partners are ongoing to finalise the concept of the WSLN and move towards action.